Repair Your Broken Cracked or Chipped Glass Fast! Over 25 years of experience and over 30,000 customers served! Joe's Glass Co can facilitate your RV glass needs. We offer OEM replacement windshields, windows, and any other RV glass replacements at a great price with service directly to your door. We work with all major insurance providers so you can get your RV glass replaced today. Joe's Glass Co offers a large selection of vinyl windows for your new or renovated home. 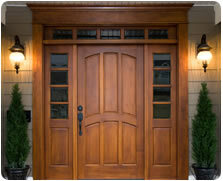 We also offer front door replacement glass for repairs. All of our windows come with the Joe's Glass Co superior customer service and quality installation. We can provide you with a free estimate, describe our installation process and answer any questions you may have. Our reviews speak for themselves. All around the pacific northwest, customers has come to Joe's Glass for their auto glass replacements and repairs. With top notch service, and affordable prices, we ensure every customer is satisfied with our glass work. If you were happy with your auto glass replacement please leave us a review on Google, review on Yelp, or like us on Facebook. Save Money; if you made Glass Replacement Improvements to your home located in the Everett WA Or Snohomish Area. Any insulation material or system that is specifically and primarily designed to reduce heat loss or gain of a home when installed in or on such a home. Any metal roof with appropriate pigmented coatings or asphalt roof with appropriate cooling granules that are specifically and primarily designed to reduce the heat gain of your home. Click here for additional information and to download the Residential Energy Tax Credit form.